An Otsego senior, with a passion for engineering, is sharing her love of the industry in a fun, creative way by hosting the first Otsego Engineering challenge for girls - FREE! 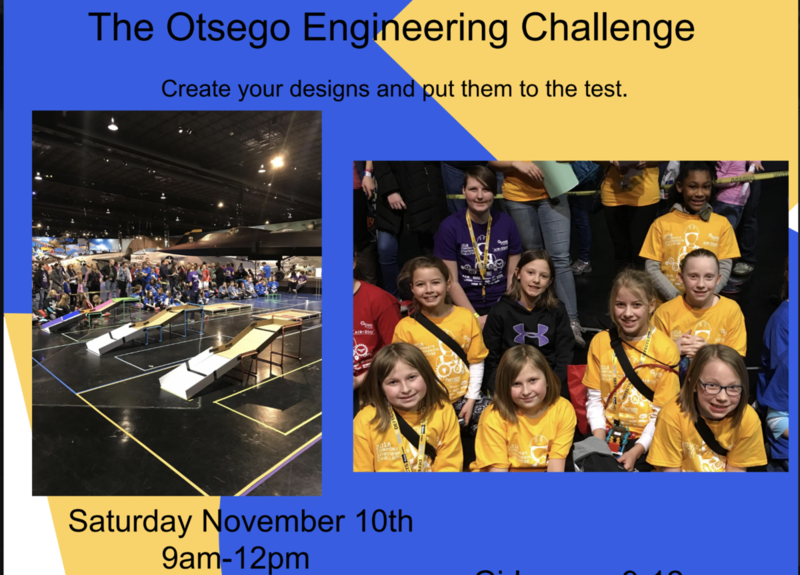 On Saturday, November 10th, girls ages 9-12 are invited to take part in the first Otsego Engineering Challenge just for girls. “I’m excited to share something that I really like with people from Otsego,” says senior Bridgitt Cornish. The event is at the Otsego High School Gymnasium, from 9am-Noon. There is no cost, but registration is required. (See sign up at the bottom.) Girls from area schools are welcome to attend, as well. Putting on this challenge, is her way of sharing that passion and showing other girls the possibilities they have in the STEM, STEAM fields. This project is specifically part of the STEAM Ready Internship program started this year at OHS. Students had to apply to be accepted. These students are spending the first trimester showing local companies what they can offer as engineers. Developing a project is a part of that process. Very few students from our district have participated and she hoping to change that with this event, “I’m hoping to be able to get more interest from girls in Otsego and Plainwell to get them in line to do more of that stuff,” she says. At this OMS challenge, girls will first hear from women engineers about the field and be able to ask questions. They’ll then be put into teams of 8 or 10, get a design challenge then spend about an hour or an hour and half on it before they compete against the other teams. Each team will have an engineer for a mentor and HS student as an assistant. She’s hoping for at least 50-64 participants. It’s a free event, but registration is required. Sign up for the Otsego Engineering Challenge online.